You can now upload files using Signed Uploads right in the "Files" section of your Project Settings. To get a file to your project via Signed Uploads, we require an extra token sent to Upload API: we enabled our Dashboard to do that. Make sure you are signed in to your Uploadcare account to check out how this works. You will need to navigate to your Dashboard, pick a Project with enabled Signed Uploads or explicitly enable the option for one. Enabling Signed Uploads will affect the behavior of widgets, libs or integrations related to the project you modify. Consider checking out the update in a test environment: create a separate project. With Signed Uploads enabled, you are now free to use the "Files" section of your project to upload files. Drop us a line in case you have any questions. You can now navigate through the complete history of your payments in Payment history. Make sure you are signed in to your Uploadcare account. The section provides you with info on each payment date, amount, and status. 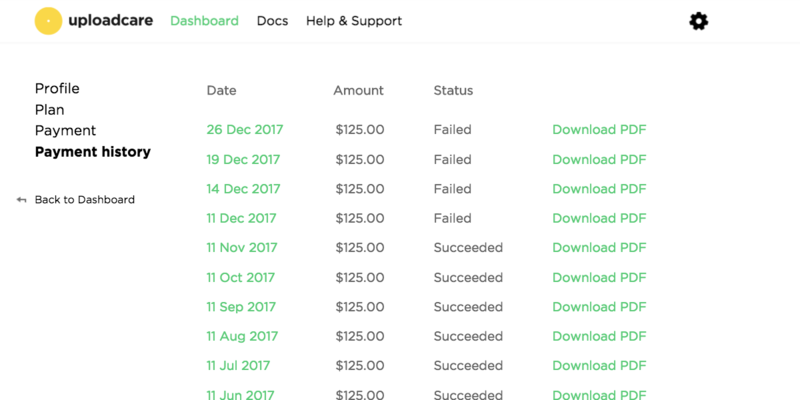 Payment history also allows you to download any invoice as PDF. Just drop us a line in case you have any questions.